If you want to learn martial arts, then you have come to the right place. We all know there are dozens of different reasons as to why people should learn martial arts. Some of them are that you will get skills in fighting and self-defense. Other reasons would be that you may become a more complete person through martial arts. We hope that you know all your reasons as to why you would start learning martial arts. One of the best martial arts that you can learn in this sense is called Muay Thai. If you find a Muay Thai training camp, then you will be able to delve deep into the field of martial arts just by taking classes in Muay Thai at Suwit gym. So, as an introduction, you will learn how to use your body in 8 main different ways. If you wish how to kick, punch, use your knee or elbows in order to deal damage – then you should start learning Muay Thai. This martial art originates from the country of Thailand. No matter who you are, if you go to Thailand and visit a Muay Thai training camp, you will find out that it’s a great martial art to learn. Boxing is also an important aspect of Muay Thai as the hands are the most powerful weapons that you can use for the purpose of training Muay Thai. In the end, it’s all up to you. We still believe that no matter who you are, you will be able to learn the basic ins and outs of Muay Thai. It may still take some time though. Depending on your talents and natural predispositions, it may take several moths before you begin to ingrain the basics of Muay Thai and start learning how to apply your martial arts skills. Why you must learn at Suwit gym? 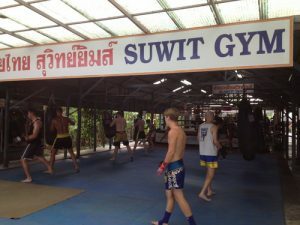 -Suwit Muay Thai gym have opened more 30 years and have many Muay Thai programs. -The training and accommodation package is 14,500 Baht a month . The training is 2 sessions a day and close on Sunday . In the end, we hope that you will enjoy your Muay Thai training sessions and that you will become a better martial artist because of them. The best thing about Muay Thai is that it’s fun. We hope that you will enjoy it for what this sport really is. Muay Thai training can do wonders for our overall health and it is especially useful for people who want to lose weight, define muscles and improve their mobility. It also has positive impact on the mental health – it has the ability to de-stress people and improve their discipline and confidence. Together with your training, you can even supply ones taste-buds any satisfied drive along with amazing Thai foodstuff. The street foodstuff associated with Phuket is usually quite popular inside Thailand, you can tastes the actual spectacular dishes associated with Thailand although coaching regarding Muay Thai in Phuket.